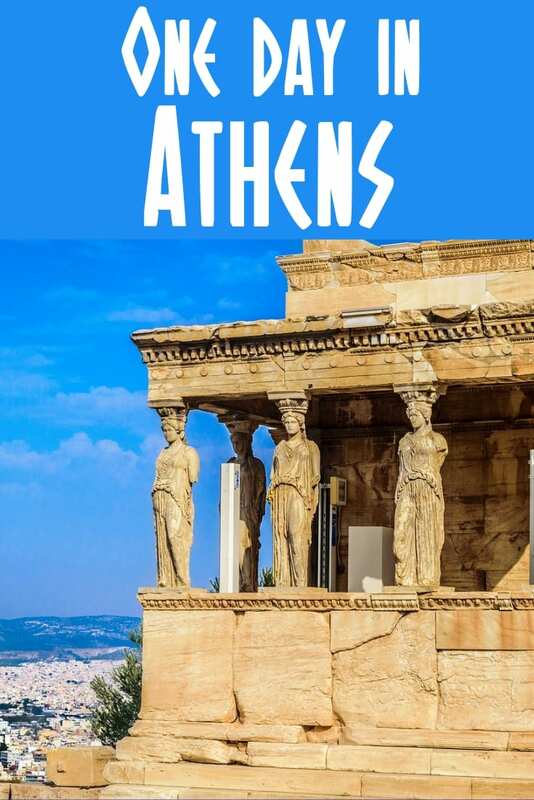 See Athens in a day with this easy to follow 1 day Athens itinerary. I'll show you what to do in Athens in one day so you don't miss a thing! Is one day enough to see Athens? It's a question I'm often asked, but it's so difficult to answer. 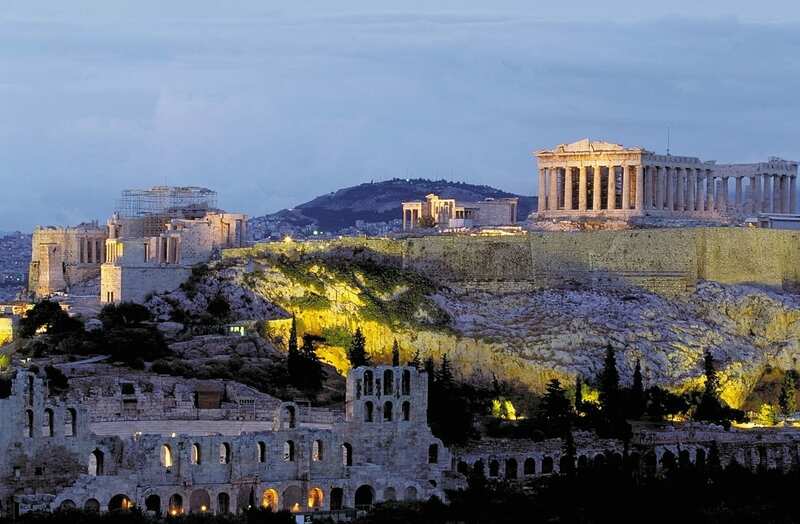 On the one hand, yes you can see most of the essential Athens attractions in 24 hours. On the the hand, it's not exactly a deep-dive into what Athens is all about. With that said, I know from my own travels that sometimes it's better to see something than not at all. So, this Athens one day itinerary is designed to help you make the most of your time in the city. It's also a good guide for spending one day in Athens from cruise ship. If you're a new reader to the blog – Hi! My name's Dave and I've been living Athens for the past 5 years. 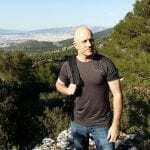 During that time, I've been writing regular travel guides to Athens and Greece based on my own semi-local knowledge and experiences. If you're interested in getting hold of some more free guides, please sign up to the newsletter below. 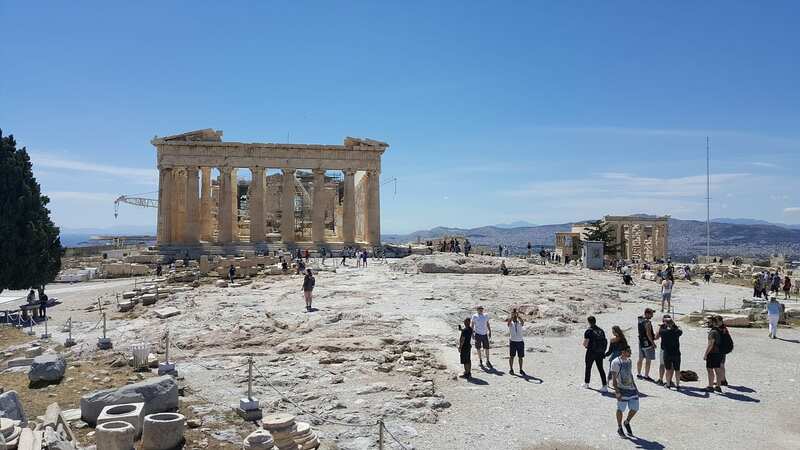 Whether you've got a layover in Athens before you jet off to the Greek islands, or will spend one day in Athens from cruise ship, this itinerary should prove useful. It includes all the main things to do in Athens, as well as a few extras to give you a taste of the contemporary side of the city. Looking for even more things to do in Athens? Take a look at my guide on how to spend 2 days in Athens. That one is the exact same Athens 2 day itinerary I use when family and friends come over to visit! Let's leap straight into the Athens 1 day city guide. A step by step guide on how to see Athens in one day, with estimated times. Visit historic sites, see awesome street art, indulge in tasty food, and relax at the end of it all with a drink at a rooftop bar for that perfect day in Athens. I've included a map of historic Athens below. You'll find that Google Maps works excellently on your phone when you arrive. Arrive at 08.00. Allow 20 minutes. If you only have 24 hours in Athens, you need to make the most of your time here! Have an early breakfast and try to get to the centre of the city, Syntagma square, by 8am. The city is already alive by then, and you will see plenty of Athenians walking around on their way to work. Just across the street from Syntagma square, you will see the Parliament. A Neoclassical building constructed between 1836 and 1847, the Parliament was originally the residence of King Otto, who was the first king of modern day Greece after its liberation from the Ottoman Empire. Since 1929, this magnificent building has been home to the Parliament of Greece. 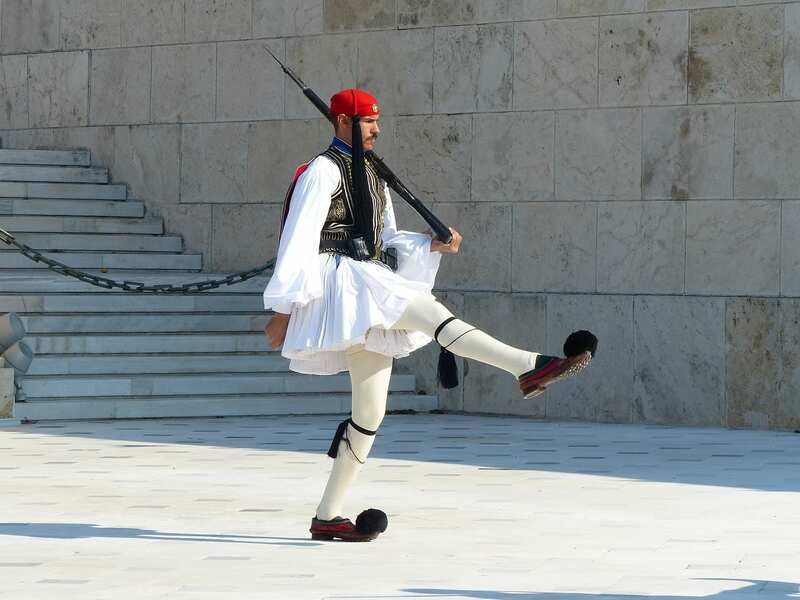 Get to the Parliament by 8am, in order to see the changing of the Guards in Athens. The Guards, called Evzones, are full-time soldiers who have a very special task – to guard the Tomb of the Unknown Soldier in front of the Parliament. The changing of the Guards happens every hour, on the hour. You are allowed to take pictures with them, but please show respect. Arrive at 09.00. Allow 30 minutes if going inside. After you have seen the changing of the Guards, head towards Hadrian’s Arch and the Temple of Olympian Zeus. You can either walk on Amalias Avenue, if you don’t mind the noise, or stroll through the Plaka area, through Nikis, Kidathineon and Lisikratous streets. Don’t worry if it all looks a little complicated on the map – Googlemaps works great in Athens Greece! The Temple of Zeus is one of the biggest ancient temples of the Greek – Roman Empire, and one of the most impressive historical places in Athens Greece. 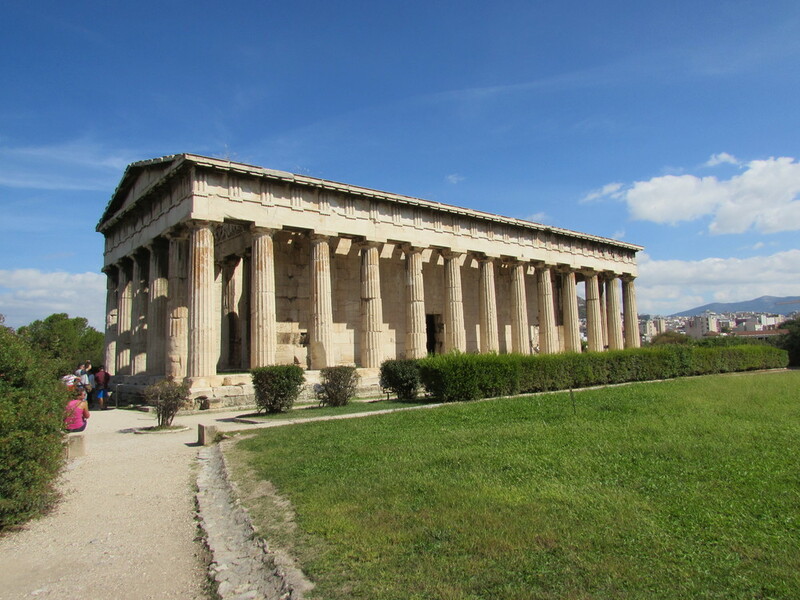 Visiting the temple would be a must-see if you had two days in Athens Greece, but it’s best to skip it and move on to the next stop if you're short on time. If you still want to visit, the entry ticket costs 6 euro. Arrive 10.00. Allow 1.5 hours inside. No list of things to see in Athens Greece would be complete without the Acropolis. This ancient complex comprises of several temples, of which the most famous is the Parthenon, dedicated to the Goddess Athena. The Acropolis does get busy, especially during the summer months, so it might be a good idea to get your ticket in advance. This skip the line Acropolis ticket with audio guide might be of interest. The Acropolis of Athens opening hours as well as the entry fee vary between seasons. In winter months, normally from November to March, the Acropolis is open from 8.00-17.00, and a single entry ticket costs 10 euro, while entrance is free on the first Sunday of each month. In the summer months, usually from April to October, opening hours are extended until 20.00, but the single entry ticket costs 20 euro. Various discounts apply for students, seniors etc, so make sure you get the correct ticket. Allow at least an hour and a half for the Acropolis, and make sure you’ve caught the views of Athens from up there. 4. 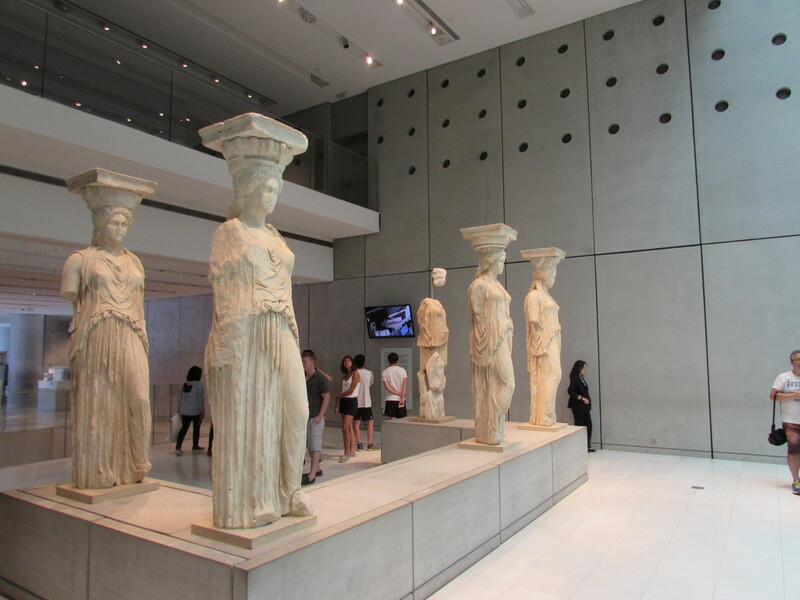 The Acropolis Museum – One of the best things to do in Athens Greece? If you are especially interested in history and archaeology, your one day in Athens itinerary should definitely include one museum. The National Archaeological museum, which is the most comprehensive museum in Athens, is not very close to the Acropolis, plus it takes a good four hours to see properly. Therefore, you can visit the New Acropolis museum, which is located across the street from the Acropolis. Although several people will disagree, I wouldn’t include the Acropolis Museum in a 1 day Athens itinerary, for reasons I have explained here. However, that’s just my personal opinion, and most people’s lists of the top ten things to do in Athens will definitely highlight the Acropolis Museum. The choice is yours! If you go, allow at least an hour and a half. The best part are the marbles at the top, although many are in the British Museum. Make sure you visit the café / restaurant – the meals are good, and the view is hard to beat. In fact, even if you weren’t planning to visit the Museum itself, you will enjoy visiting the café. Visit information to the museum can be found here. Entrance to the café / restaurant is free, and you will need to obtain a free admission ticket from the counter. After leaving the Acropolis, it’s time for a stroll on one of the most picturesque areas of Athens, Areopagitou Street. You will have probably realized by now that you can’t really see Athens in 1 day – however, this walk is one of the absolutely must do things in Athens Greece. As you head towards Thisseio metro station, the road changes name to Apostolou Pavlou. At this point, you will see a large green space on your left hand side. This is Filopappou hill, the area where Socrates’ prison can allegedly be found and where many modern Athenians bring their dogs for a walk. 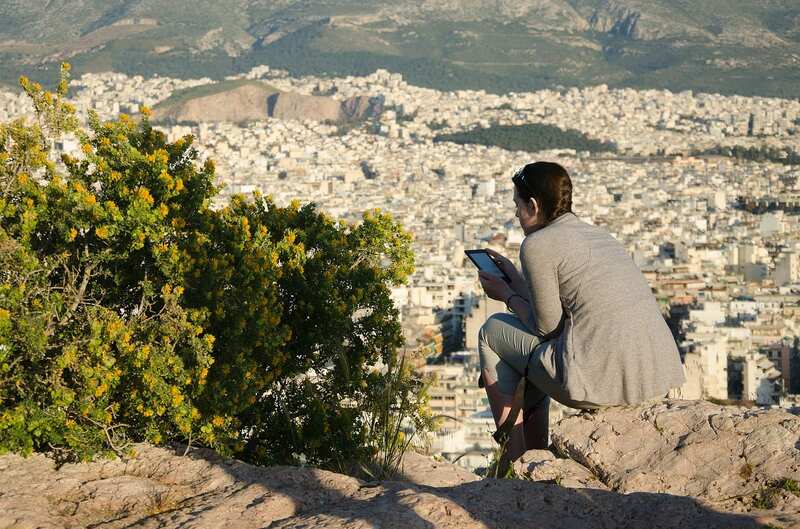 Instead of going left, turn right on a paved, unnamed road, and head towards Areopagus Hill, one of the best viewing points of the city when visiting Athens. In Ancient Greece, the Areopagus was the court of justice for many cases, including homicide and anything to do with olive trees. Areopagus also is the spot where Apostle Paul chose to preach Christianity in 51 AD. The view of the Acropolis from up here is really great, which explains why it can get crowded at times. Unless you stopped at the Acropolis Museum, this is definitely time for lunch! Backtrack to Apostolou Pavlou street and continue heading towards Thisseio. You will find plenty of places for snacks, coffee or beer, overlooking the Acropolis. You will see plenty of locals sitting there, so just pick your favourite spot and enjoy the views. If it’s not the views, but great food that you are after, Athenians seem to like Iliostasio Thisio and Καφενείο Σκάλες, on Herakleidon street. Start 14.00. Allow 2 hours. Time to hit the markets! Although there are still plenty of things to do in Athens in terms of archaeological sites, chances are that you might now want to see something slightly different. And as you are approaching the markets area, nothing would be more suitable. Continue walking until you have reached Thisseio metro station, and then turn right on Adrianou street, where you will see plenty of eateries on your right hand side, and the Ancient Agora on your left hand side. Although it’s one of my favourite historical places in Athens Greece, it would take a good two hours to see the whole Ancient Agora and the Museum properly, so it will probably not fit in your 1 day in Athens itinerary. Head up Adrianou, left on Kinetou and then right on Ifestou street, walking towards Monastiraki metro. This is a street where you can buy clothes, souvenirs, old vinyl records, army and camping equipment and other random items. 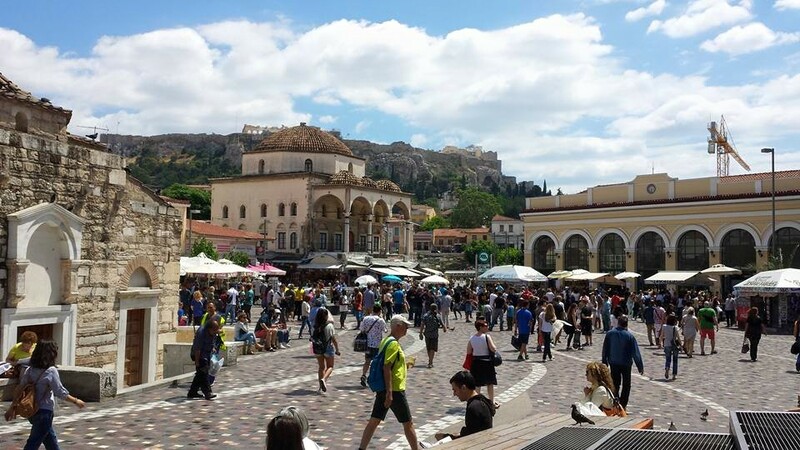 You will soon reach bustling Monastiraki square, where you are likely to see street musicians and people selling random stuff, but also lots of locals hanging around. Although it's one of the essential focal points of the city, and a must when looking for things to see in Athens in one day, there's no need to spend too long on the square itself. Walk across the square, heading towards Athinas street. This is where Athenians do their produce shopping, in Varvakios Central Market. 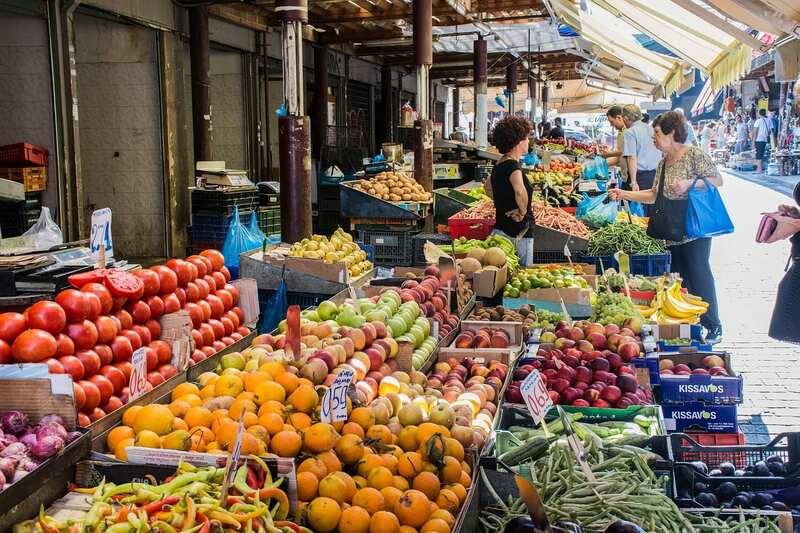 Although you will be rather unlikely to want to buy any meat or fish, you will definitely find this market one of the more interesting places in Athens. If you were planning to buy any herbs, spices, olives or olive oil, this is the place to get them. Opposite, you will find the fruit and veg market, which is very colourful. Parts of the market start closing at 15.00, but others are open until 18.00 or 19.00, so you will have plenty of time to look around. Note that haggling doesn’t work here and that the market is closed on Sundays. Start 16.00. Allow 2 hours. From Varvakios market, backtrack on Athinas street, and turn right on Evripidou street, which is the beginning of the tiny Chinatown and little India areas of Athens. Some people have found those areas a little intimidating, so you might want to take this into account. From Evripidou street, turn immediately left on Agiou Dimitriou, and head straight to Psirri square, marked on Googlemaps as Pl. Iroon. Turn around and look up, and you will see one of the most iconic pieces of street art in Athens. 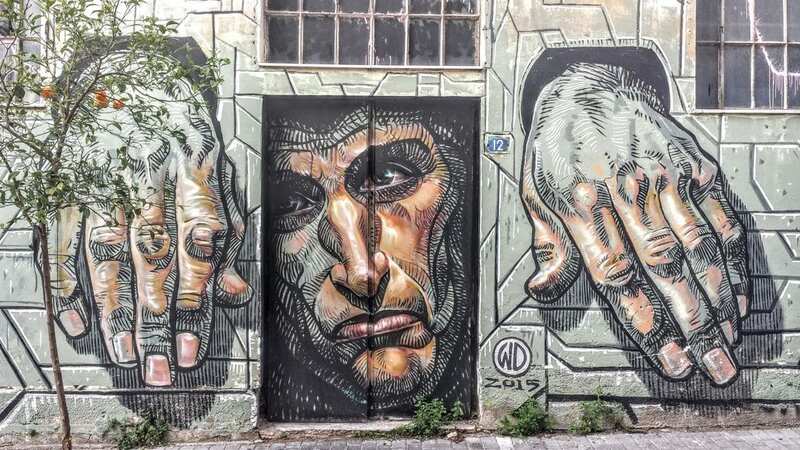 The whole area of Psirri is one of the best places to visit in Athens for street art. The top streets for street art in Athens are Aristofanous, Sarri, Riga Palamidou, Ag. Anargiron, Louka, Nika and Agatharchou. Start 18.00. Allow whatever you like! Once you are done with street art hunting, head back to Psirri square. You can have a dessert at Serbetospito – watch out as the portions are huge, so two people can most likely share one dessert. You can also have a beer at nearby Beertime – they have imported beers but also Greek craft beers, so you will get a chance to taste something apart from the famous Greek ouzo. Alternatively, if you are hungry, one of the best restaurants in this area is Mavros Gatos on Navarchou Apostoli Street. In fact this is one of the best places to eat in the centre of Athens, and there is no single dish I can recommend as everything is really good! With just 1 day in Athens Greece, you won’t have many opportunities for nightlife, so this is your chance to make the most of it. And nothing is better than some mingling with the locals and checking out the real culture. Rembetiko music rarely features on “one day in Athens what to see” guides, but in my opinion it’s a very unique activity – especially if, like me, you like local music. 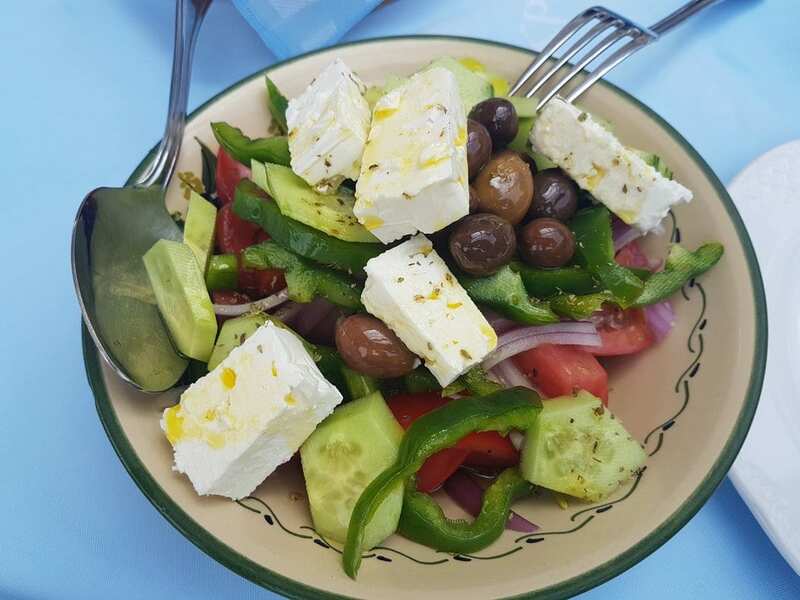 A great choice in the wider area is Kapnikarea, on Christopoulou 2, no more than a ten minute walk from Psiri. They have live music sessions on all days of the week, but times differ from day to day and season to season. A pretty safe window is 18.00-22.00, apart from Sundays when they might close earlier. The food isn’t the best food in Athens, but it’s ok, or you can have a beer or a drink instead. The music, on the other hand, is great – the rembetiko musicians really put their soul into it. If you feel like another drink but you don’t really want to change areas, you can finish off your Athens sightseeing day either at 360 Degrees or at A for Athens rooftop bar / café, both near Monastiraki metro. They have some of the best views of the Acropolis, and they are more affordable than other rooftop hotel bars in the area. As these places are quite popular with locals and tourists alike, walking up the stairs might be quicker than using the elevator! Or if you want a tried and tested franchise bar and restaurant, you can always walk to Hard Rock Athens, on Adrianou street. If you still have energy and you want to make the most of your 24 hours in Athens, don’t worry – the night is still very young. Walk or take the metro or a taxi to Gazi / Kerameikos area, where the young Athenians go for drinks. There are plenty of bars in the area, and you will definitely find something that suits you. Because of some people's timetables, particularly if arriving by cruise ship, your time in the city may be limited. If that's the case, I would suggest a day tour of Athens. 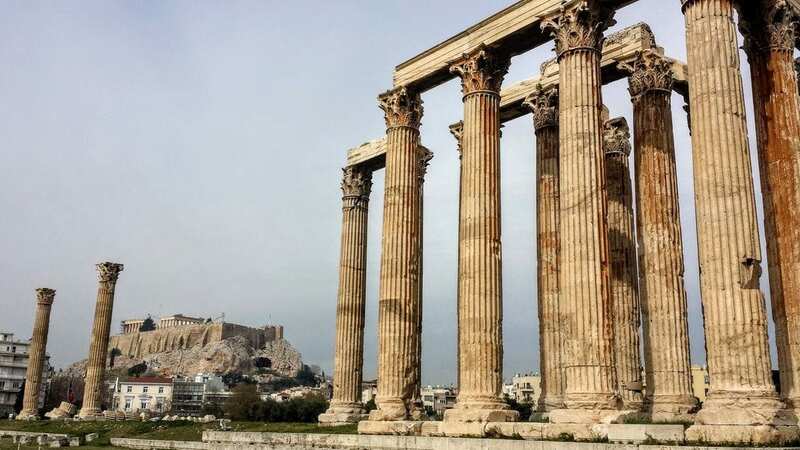 There are many available, and the one that makes most sense for people who visit Athens for just a half day, is the guided Acropolis and Acropolis museum tour. Please pin my guide on what to do in Athens in one day for later. Hover over it, and the red pin button should appear! Alternatively, please feel free to share the things to do in Athens in one day blog post using the social media buttons at the bottom of the post. There you have it! This is my guide on how to spend 24 hours in Athens Greece. I hope this helps you plan your Athens itinerary, and you can take out any activities that you are not interested in. If you have any questions, feel free to ask in the comments below. And if someone you know is going to visit Athens soon and asks you “what can you do in Athens Greece”, make sure you point them this direction. If you are planning a trip to Athens and Greece, you might also find these other travel blog posts useful. They go into more detail on what to see in Athens and other parts of the country. I’m sure to refer on this post in my travel planning for Greece. This is very helpful and informative.